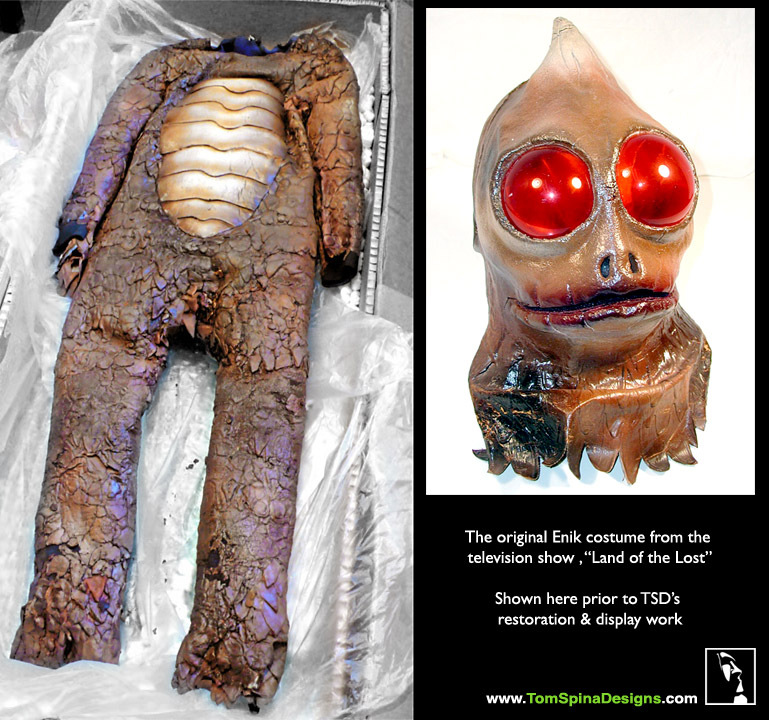 An original Enik Land of the Lost costume from Sid and Marty Krofft’s classic 1970’s sci-fi fantasy tv series. 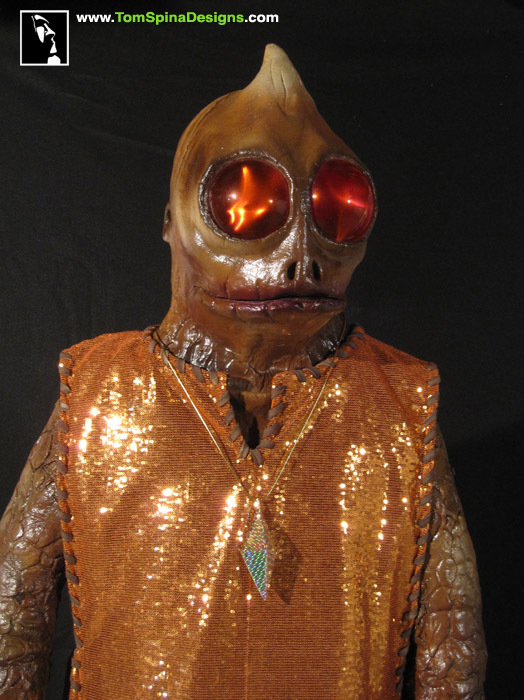 When Enik the Altrusian (some call him a Sleestak!) 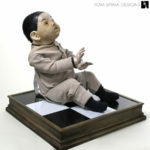 arrived in our studio, he was in poor shape. 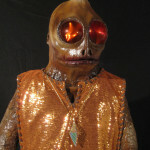 His latex television-worn costume was crumbling, riddled with cracks and missing scales. 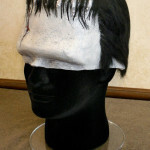 One of his sleeve cuffs was torn off and the other was gone… the mask would also need attention. 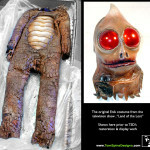 But the original Enik Land of the Lost costume was in good hands! 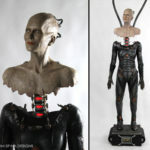 We started by stabilizing the costume prior to handling and mannequin work. Each of the countless cracks were glued and sealed. 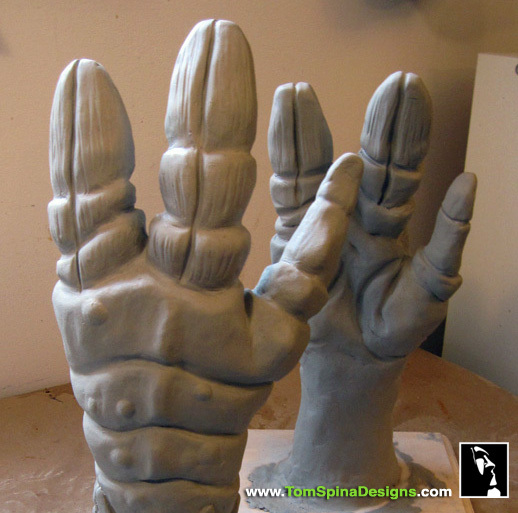 While the aging television prop costume’s restoration continued, Mike Thomas started work on sculptures to recreate the missing hands and feet. 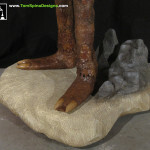 These sculptures were cast in foam-filled latex and painted to match the aged look of the original 1970’s era Enik Land of the Lost costume. 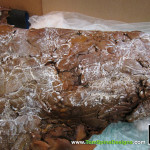 Missing latex scales were recreated and carefully blended to seamlessly match the original material (which had an incredibly random and unique coloration due to age and condition). 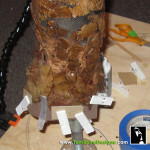 Many hours were spent painstakingly reattaching and reinforcing scales! 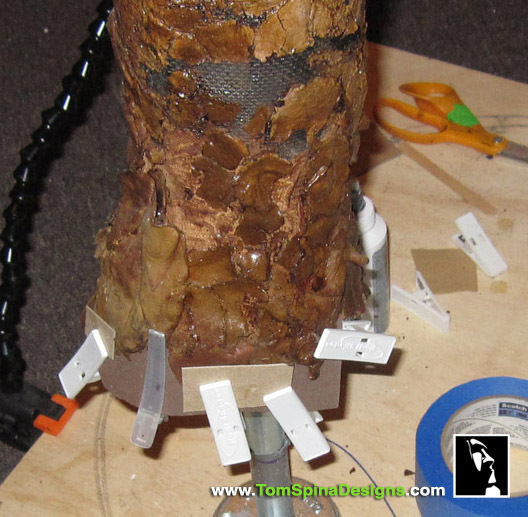 Such is the slow and careful work of movie prop restoration! 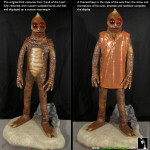 The restored sleestak’s rubber costume was mounted on a completely custom-made mannequin with a themed base. 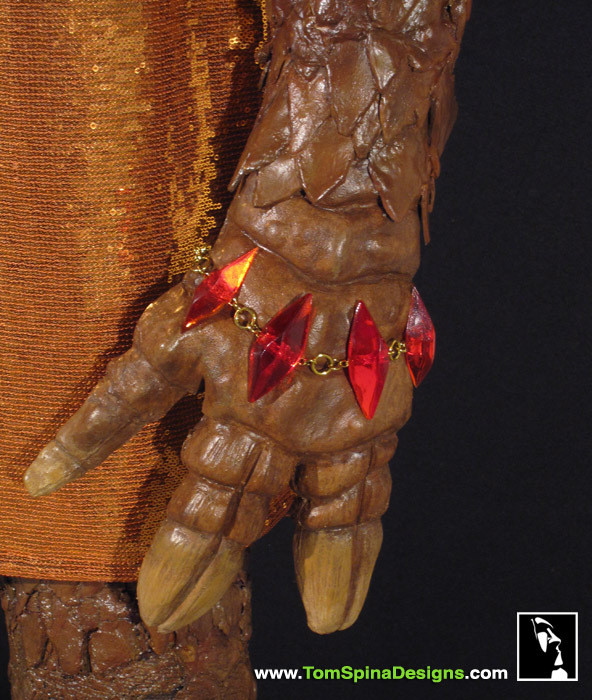 At the client’s request, replicas of his tunic, bracelet and necklace were created to complete the display. The fabric for the tunic is a spot-on match to the original! 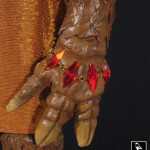 The gem bracelet was sculpted by Tom Spina and cast in bubble-free clear red resin by Lonnie Hale. The necklace’s prismatic design is also a perfect match for the original prop from the show! 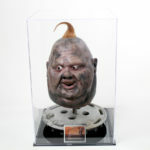 The original latex prop mask received a gentle refurbishing as well. 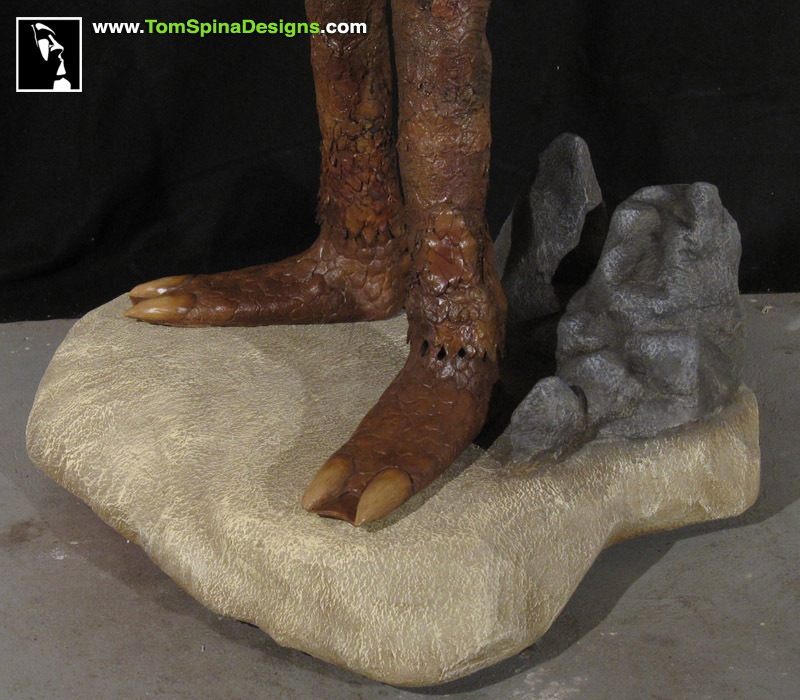 The base is carved foam with a coating and was made to evoke the somewhat crude look of the sets from the original Land of the Lost TV show. It also has a great “Aurora model kit” vibe to it for all the classic monster kids out there! 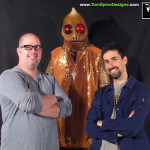 Have an original tv or movie prop in need of restoration or display? Want to see Enik in his natural habitat? Download and watch the series here! 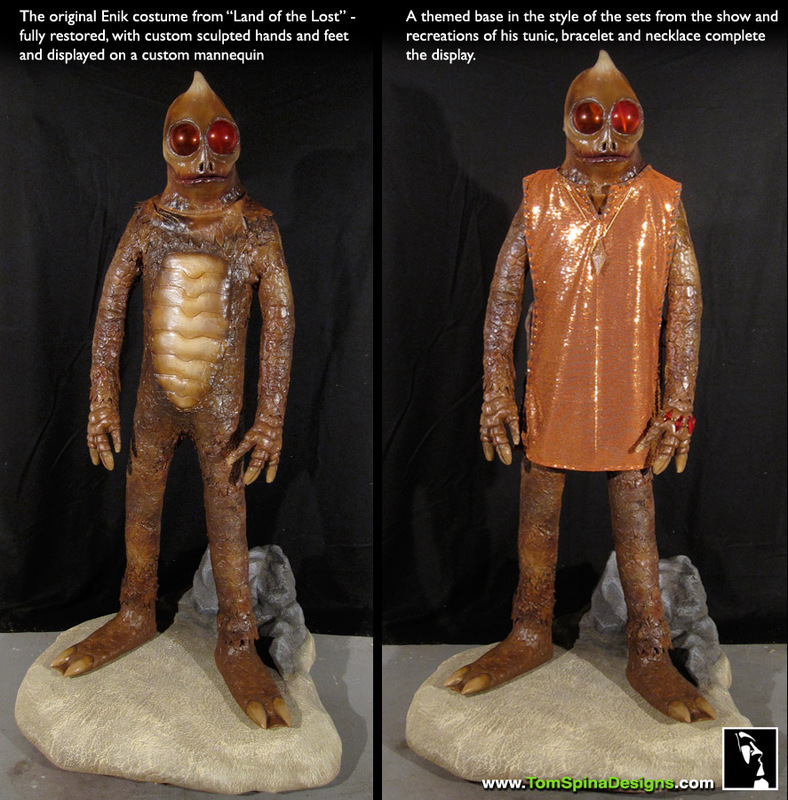 A little over twelve years ago I realized the impossible dream of acquiring the one and only Enik costume, screen-used on the Sid and Marty Krofft tv show Land Of The Lost. That was the good news. 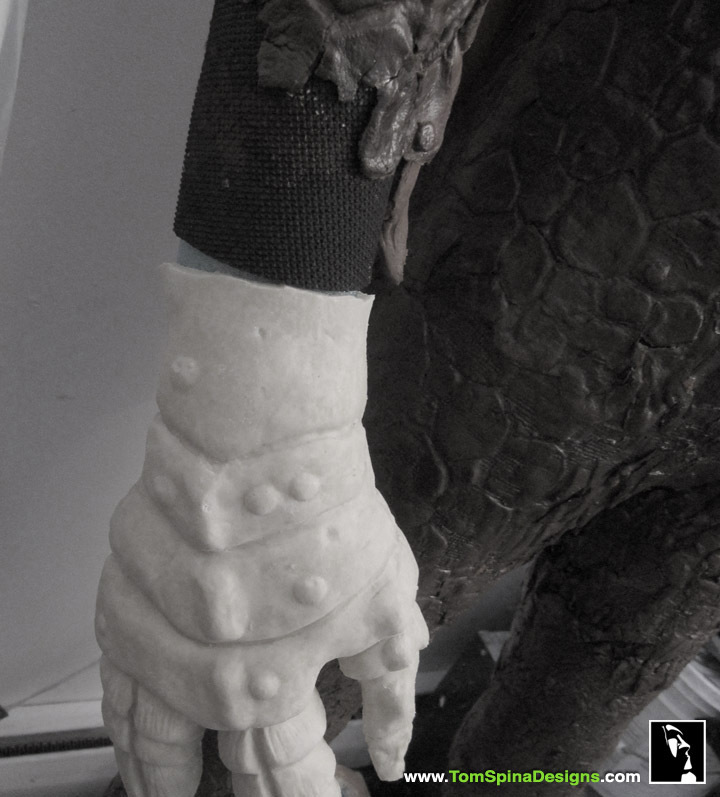 The bad news was that the hands, feet, tunic, and accessories were missing and, to make matters worse, the latex & neoprene suit was crusty and crumbly. After over a decade of storage, I decided to locate someone to perform the much needed restoration. 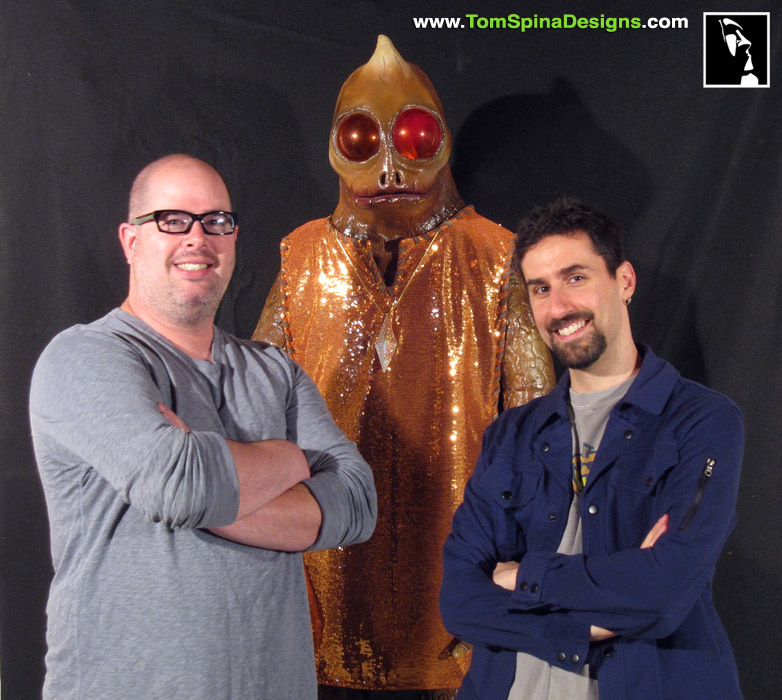 As fate (and luck) would have it, a cursory internet search turned up Tom Spina Designs. The web site appeared impressive and after a few phone conversations I was convinced they were the perfect shop for the job. 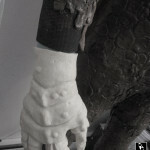 The scope of the work involved specialized sculpting, repair, paint matching, sealing, and display mounting to exacting standards…..everything had to be authentic and matching period reference material of the costume. 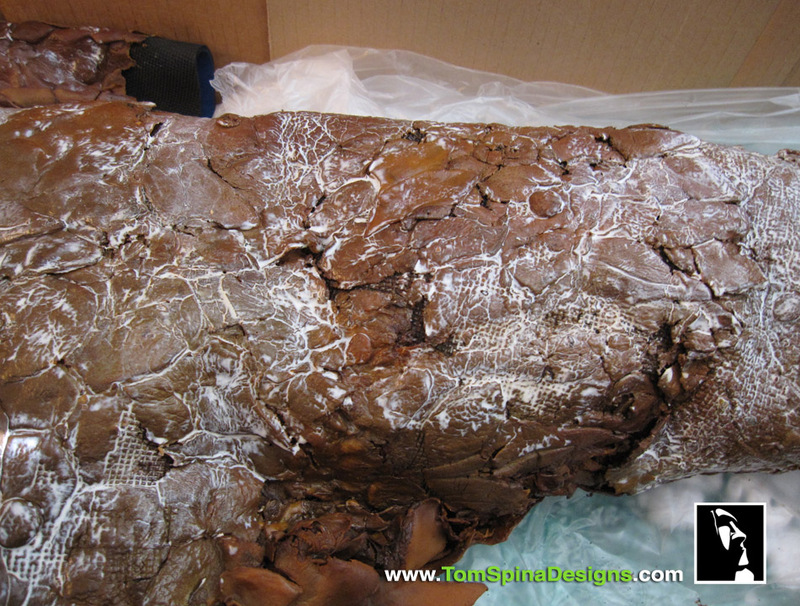 Recently, the work was completed and I had the distinct pleasure of picking up the finished display. Upon viewing the newly restored and rejuvenated Enik, I was speechless! Even my most lofty expectations were exceeded! 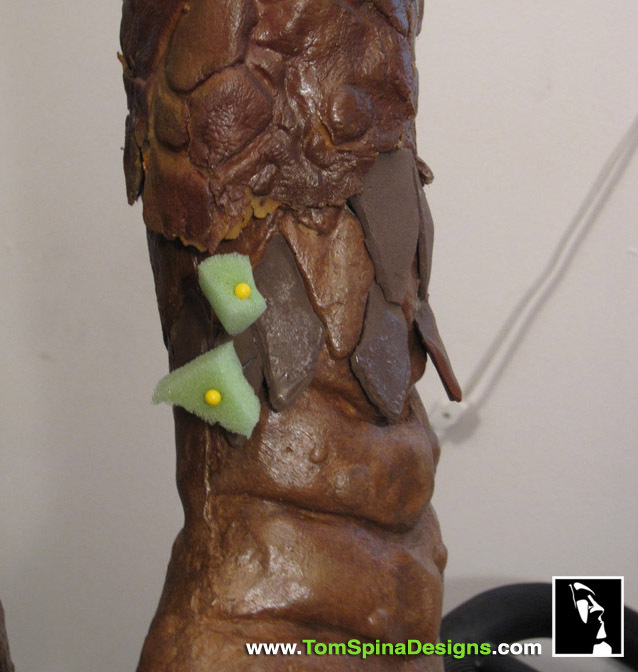 The level of craftsmanship and dedication to detail is phenomenal, placing Tom and his fellow wizards at the pinnacle of their art. Needless to say, every step of the process was handled with the utmost in professionalism and pride in their work. I am so pleased with every facet of this transaction and would highly recommend Tom Spina Designs to anyone contemplating prop restoration of any type. 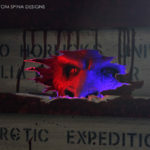 They truly brought Enik back to life!